If printing were as fun as the other aspects of your photography, you might engage more often. Right? After all, we like sharing prints. It's the creating them that can be frustrating. In this week's podcast I explain a few nimble options for creating prints that just might get your juices flowing. I use mobile devices such as the iPhone and iPad, a compact printer, and a few other goodies. Give it a listen and decide if a nimble printing setup might be the ticket to you creating prints to share with friends, family, and even clients. Technical note: My recording studio is still under repair because of water damage. So I'm having to use a portable rig that doesn't have as high quality audio. I'm hoping to be back in the studio next week. In the meantime, please hang in there until I return to normal life. Thanks! 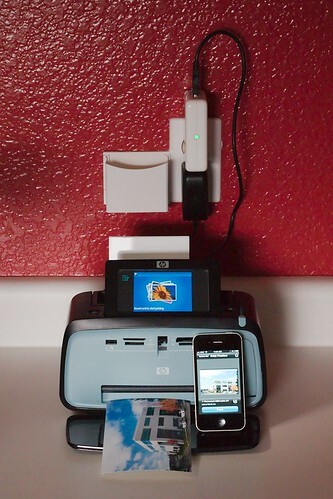 Nimble printing set-up with HP compact printer, AirPort Express, and iPhone app.